A 500 year old book discovered in Turkey around 29 years ago and rediscovered in 2000, has just been forged by some Muslim Turkish tabloids to make some interesting news for the Muslim world. Interstingly, till date there is no evidence or images of the book shown by these Turkish tabloids pointing to their claims. Here are some facts about the book. The book was first found in 1985 by smugglers during a raid. The book was lost for more than 15 years and rediscovered in 2000 in a police station in Turkey. 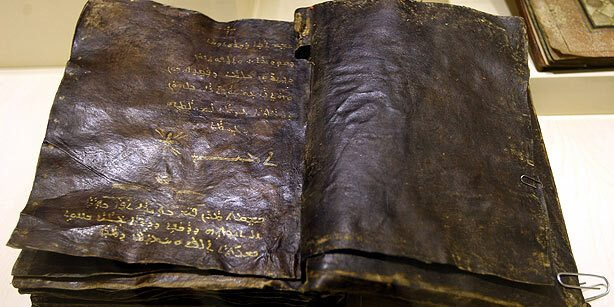 When the Turkish authorities examined the book, it was not the Gospel of Barnabas that everyone claimed it to be but just a mere collection of random verses and quotes from the Bible. The book has recently caught the limelight after some muslim turkish tabloids started to focus on this old news. Why the book is just a hoax? The Book starts with “In the 1500th year of our lord” Well, as everyone knows, Jesus Christ was born 2000 years ago. So, 1500th year would mean just 500 years back and not 1500 years as most of the news headlines state. The book is written in modern currently spoken Assyrian and not the ancient Aramaic or Syriac. This would mean the book was written probabily in this century itself or a 100 years before as modern Assyrian came to practise just 150 years ago. The book contains enormous amount of spelling mistakes and grammatical errors which means it was written by a person who does not know or is not a native speaker of Assyrian. Usually, Bibical scrolls are error free. The book never states its a “Bible” or “Gospel” or “Holy Book”. So, the referrence to Bible is irrelevant. The book is a bound flat book as the ones we have in practise and is not a scroll. Scrolls were the means of writting 1500 years back. From these details we find that the entire story is a manupulated story by Muslim Turkish tabloids with no evidence or facts from an book found almost 30 years ago. According to Al Bawaba, the Turkish Minister of Culture and Tourism, Ertugrul Gunay, ‘in line with Islamic belief, the Gospel of Barnabas treats Jesus as a human being and not as God. It rejects the idea of the Holy Trinity and the Crucifixion and reveals that Jesus predicted the coming of the Prophet Muhammad.’ Interestingly, there is no photo or video or direct evidence from any of the tabloids or from the Muslim government to prove that its a Gospel of Barnabas and that it states that Jesus was just a human being. In recent times, the Islamic community is finding it hard to find evidence to prove that Mohameed story was foretold by another prophet. Statement by Al Bawaba just gives way to real reason behind why the hoax was created and what the Turkish government is trying to acheive against the Christian community and its beliefs. Previous story Is Homosexuality a Sin According to the Holy Bible?